PALMER — Blaine Hartman tried to breathe life into the little girl who became one of four people killed Monday in a Parks Highway collision. The surgical technician and his wife joined a corps of volunteers rendering help as they waited for medics in ambulances and helicopters to reach the crash site at about Mile 156, an isolated stretch of the highway at Denali State Park. The Hartmans stopped in traffic a few dozen cars back from the accident that closed the highway around 4:30 p.m. at the end of the busy Labor Day weekend. "A guy came along on a skateboard," Lizzie Hartman said Tuesday by phone from Fairbanks. "He was asking if people were medical people, or had supplies, or had a fire extinguisher." Blaine Hartman grabbed his "arsenal" of supplies and ran to the front of the line, his wife said. The accident scene was terrible — chaotic and confusing, Lizzie Hartman said. "A lot of people were crying," she said. Blaine Hartman and a nurse helped 5-year-old Addie Bloomquist breathe, she said. Her husband rubbed the little girl's feet. It took 30 to 45 minutes for ambulances to arrive, she estimated. They thought the girl — Hartman called her "the sweetest little fighter" on social media — would make it. Another friend happened to be closer to the front and ended up helping with everything from materials and water to CPR, she said. "It was just amazing the amount of people that were there just working so hard." 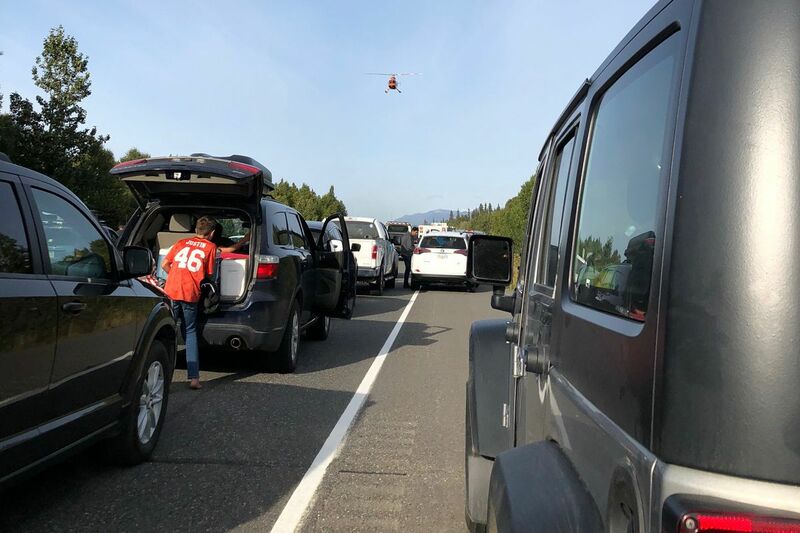 Alaska State Troopers said a southbound 2018 Subaru Outback driven by 40-year-old Cary Taylor-Bloomquist of Palmer crossed into northbound traffic, hitting two motorcycles and a pickup. Her daughter was in a child seat in back. A married couple on one motorcycle — Jeffrey Esley, 63, and Charlene Esley, 60, of Fairbanks — died at the scene, troopers said. David Fulton, a 62-year-old from Fairbanks, was on another motorcycle involved in the crash. Fulton was in critical condition Tuesday, according to a spokesman for Providence Alaska Medical Center, where he was flown for care. Following the motorcycles was a GMC Sierra pickup driven by Fulton's wife, Heidi Fulton, 50. Traveling with her were passenger Chelsea Bryner, 29, of Fairbanks and her children, troopers said Tuesday. Taylor-Bloomquist's Subaru, still in the northbound lane, collided with Fulton's pickup. That collision killed Taylor-Bloomquist and critically injured 5-year-old Addie, who was pronounced dead at Providence Alaska Medical Center. Bryner and her children, ages 10 and 3, were transported by ambulance to Mat-Su Regional Medical Center with what were believed to be non-life-threatening injuries. Fulton and Addie Bloomquist flew to Providence in LifeMed helicopters. "Dave is in ICU," Heidi Fulton posted on Facebook early Tuesday. "He has a long road of recovery ahead of him. I will know more tomorrow. Thanks for all the prayers and comments. I love you all." Cary Taylor-Bloomquist was a longtime teacher and coach in the Copper River Valley, Mat-Su and Anchorage who also worked as a hunting guide. She taught special-education math and science at Palmer High School last year, according to a bio she wrote for her teacher page. She spent a year in the Copper River School District. Taylor-Bloomquist described herself as a 15-year Alaska resident who taught middle and high school science for 14 years in Kenny Lake, Tok and Anchorage and also Minnesota. She coached soccer, volleyball and cross-country skiing, and was certified with the National Archery in the Schools Program as well as the Alaska Department of Fish and Game as a basic hunter education and muzzle-loader instructor. Charlene Esley, one of the motorcycle riders who died in the accident, worked for years in the meat department of the Fred Meyer on Airport Way in Fairbanks. Esley was very friendly and had many connections in the community, store manager Randy Mitchell said Tuesday morning. "It affects everyone in the store here today," he said of her loss. "Many, many people knew her."